One year only issue for FAO Food Security. This coin features the supreme god of the islands, Tangaroa, the god of fertility and peace, fondly referred to as Papa on the islands. 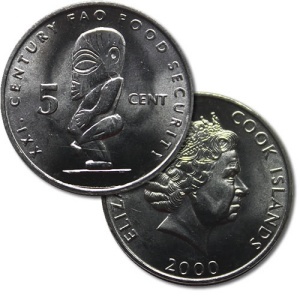 This unusual coin shows Queen Elizabeth II on the obverse and Tangaroa bearing all on the reverse.